Barbitinnovans.info is the PUP that uses misleading techniques to prevent removal. Use Reimage to locate malicious components and get rid of them faster than with uninstall instructions. A full system scan blocks virus reappearance and prevents traffic to malicious domains. 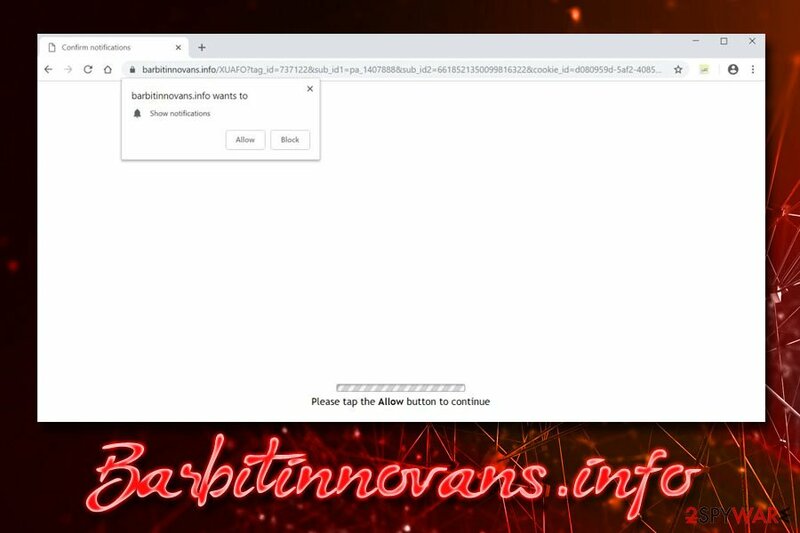 Barbitinnovans.info is a suspicious domain that asks you to allow notifications to either view a video or the contents of the alleged website. However, as soon as you click Allow, you will not see anything, and instead, you will be forced to see pop-ads, redirects, and similar disturbances on Google Chrome, Mozilla Firefox, Safari, or MS Edge browser. While it is common for websites to ask permission to show notifications (and extremely useful feature when used on legitimate sites), Barbitinnovans.info pop-up should never be trusted. If you landed on this dubious website, you should immediately close down your browser and check your computer for adware. This unwanted software often hides in bundles, so its infiltration is hardly ever noticed. Additionally, many apps, such as browser extensions, media players, file converters and similar seemingly useful programs can be adware in disguise. Ad-supported software relies on pay-per-click, or pay-per-install techniques, even if it can bring end users a lot of trouble, like personal information leak or malware infection. Affected browsers Google Chrome, Internet Explorer, Mozilla Firefox, Opera, Safari, etc. Symptoms Intrusive advertisement, redirects, sponsored search links, etc. Many websites use “Allow Notifications” feature in order to display information and news feed directly to subscribed users' screens. It is indeed a useful function, however, bad actors are also abusing it, as the amount of so-called push notification virus sites spiked (Worldnaturenet.xyz, Directlinkkpush.com, and many others). Nevertheless, if your browser is suffering from pop-up ads and push notifications, Barbitinnovans.info virus removal can guarantee the unwanted content elimination from your browser. While Barbitinnovans.info is technically not a virus, it posses many qualities of such. 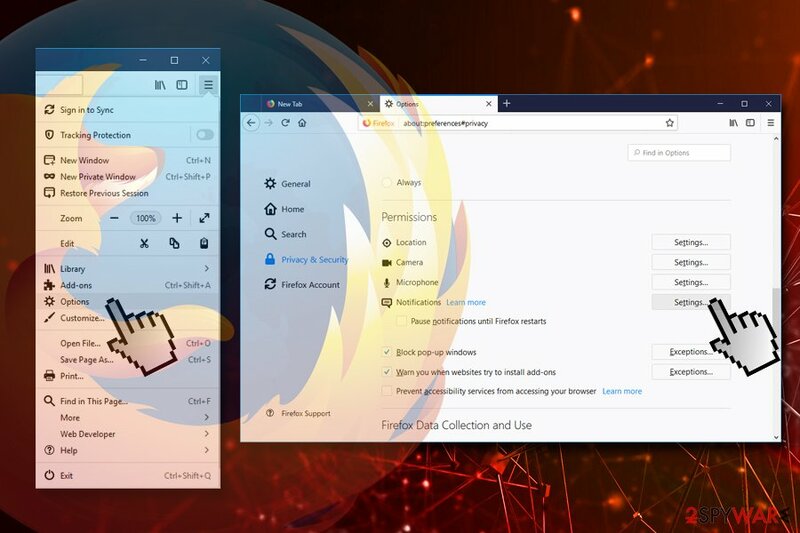 For example, several changes can be made in order to display the unwanted content to users – changed DNS settings, modified Windows Registry, and similar. These alterations can be set back manually or by using PC repair software like Reimage. Therefore, as soon as you remove Barbitinnovans.info adware, make sure to bring your systems' settings back to normal. Therefore, sometimes a seemingly harmless adware infection can lead to ransomware, cryptomining malware, and similar threats, without users initiating the infiltration. For that reason, Barbitinnovans.info and similar threats should never be ignored. Putting cybersecurity aside, Barbitinnovans.info PUP's continual redirects and pop-ups can result in a lot of frustration to users. Getting through all the sponsored content and finding what you actually need might be an every-day struggle. Thus, never click on suspicious pop-ups and close down your browser immediately to avoid installation of adware like Barbitinnovans.info. If you already infected, however, check our removal guide below this article. Free software developers often collaborate with PUP authors to gain benefit for both parties. While the latter profit from increased installation rates, freeware distributors are getting income for every installation made by users. Therefore, the scheme works perfectly (that is why the epidemic of cyber infections spiked since software bundling started being used). Install reputable security software with real-time protection feature. Barbitinnovans.info removal should not be delayed, as, as we mentioned already, adware infection might lead users to malware-infested sites and result in much more severe infections. For that purpose, you can use security tools or our guide provided below. If you choose security program to remove Barbitinnovans.info virus, be aware that not all of the anti-malware software recognize all PUPs. Therefore, you might have to scan your machine with several different applications before being successful. If you pick manual Barbitinnovans.info elimination method, you should check our detailed instructions below. Make sure you follow them carefully and rather opt for automatic removal if you are not that IT savvy. Here, look for Barbitinnovans.info or any other recently installed suspicious programs. Wait until you see Applications folder and look for Barbitinnovans.info or any other suspicious programs on it. Now right click on every of such entries and select Move to Trash. When in the new window, check Delete personal settings and select Reset again to complete Barbitinnovans.info removal. Once these steps are finished, Barbitinnovans.info should be removed from your Microsoft Edge browser. Here, select Barbitinnovans.info and other questionable plugins. Click Remove to delete these entries. Now you will see Reset Firefox to its default state message with Reset Firefox button. Click this button for several times and complete Barbitinnovans.info removal. Here, select Barbitinnovans.info and other malicious plugins and select trash icon to delete these entries. Click Reset to confirm this action and complete Barbitinnovans.info removal. Here, select Extensions and look for Barbitinnovans.info or other suspicious entries. Click on the Uninstall button to get rid each of them. Now you will see a detailed dialog window filled with reset options. All of those options are usually checked, but you can specify which of them you want to reset. Click the Reset button to complete Barbitinnovans.info removal process. ^ Mohsin Qadir. What is DNS hijacking and How It Works?. PUREVPN. VPN service. ^ SenzaVirus. SenzaVirus. Cybersecurity research team. This entry was posted on 2018-11-30 at 04:17 and is filed under Adware, Viruses. You can quickly scan the QR code with your mobile device and have Barbitinnovans.info manual removal instructions right in your pocket. 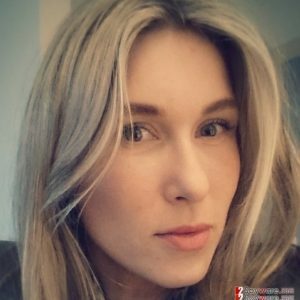 How did you remove Barbitinnovans.info?